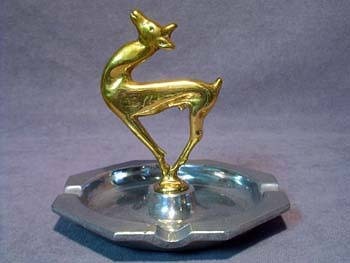 A beautiful spirited 4" gazelle, styled in brass, takes his proud position atop the center elevation of the heavy octagonal aluminum ashtray. Highly polished, the ashtray measures 4-7/8" from side to side, with resting capacity for four cigarettes. This captivating figural ashtray is in superb condition.